When you think of the history of hip hop, places like Los Angeles, New York and even Atlanta come to mind. In this groundbreaking documentary, local director Teddy Cool teams up with Executive Producers King Hollis and John Huffman IV to throw down the cardboard dance floor gauntlet and show why Dallas deserves its place in the annals of hip hop, break dancing and finding new beats and artists. 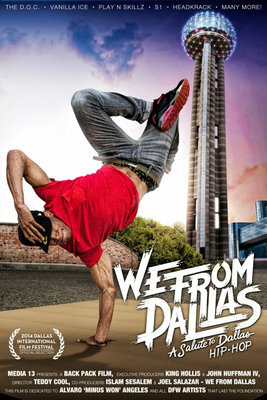 Media 13 Studios in association with Rec Shop, Too Fresh Productions and the HipHopDraft presents ‘We From Dallas’. A locally produced documentary covering the rise of hip hop culture in Dallas, Texas. From the early days of KNON radio, the golden era of Deep Ellum, and the rise of the southern rap culture, we speak to the heroes and legends that made it all possible. DJ’s, producers, emcess, b-boys, graffiti artists, no stone is left unturned. For the first time, all the architects of Dallas hip-hop are brought together in a feature length documentary to speak on their city, the music, the fans and to let the world know WE FROM DALLAS. Our ultimate goal is to inspire at risk young people and discover and support the next generation of artists via our digital series and annual televised showcase called the HipHopDraft. As a part of our strategy to accomplish our goal we are teaming up with local crews and producing a series of "WE FROM" films about all things associated with the early days of hip hop culture in major cities in America ~ and then around the world. We are proud that our first completed film in the series, "WE FROM DALLAS", premiers at the Dallas International Film Festival on April 8th at the Angelica Theatre in Dallas, Texas at 7:30 PM and a second screening at the on April 12 at 10:15 PM. Huffman.co is a startup business creator for entertainment, marketing and technology entrepreneurs and intrapreneurs. Using our process, we create companies and projects that should exist and partner with leaders, team members, strategic partners and financiers who help us succeed. Google's Code of Conduct team confirms that Google Mechanical Engineer Taylor Roan's involvement with Phontaine, LLC (a company created at Huffman.co) is acceptable. Roan will be working with John Huffman IV and Phontaine Judd to develop hardware products, with patent potential, for families.